IBM said on Friday that it is teaming up with Chinese internet provider Tencent to build and sell a new set of cloud services to Chinese businesses. Tencent isn’t a household name in the US, but it is in China where it provides internet to 1 billion users. IBM and Tencent are going to build a bunch of new applications for Chinese businesses, hosted on the new cloud. These apps will include customer support, online marketing, and “enterprise asset management,” which is a fancy term for helping companies keep track of their PCs, mobile phones, servers, software licenses, etc. This is the second big partnership deal IBM announced this week. The first was a “landmark” deal with Twitter, as the two companies described it, where IBM will write a bunch of new business apps, hosted on IBM’s cloud, that make better use of Twitter data, and train 10,000 consultants to help. IBM CEO Ginni Rometty did not indicate how much of an impact on its bottom line she thinks these deals will be. 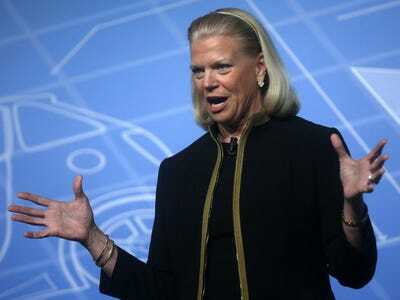 IBM revenues have been shrinking over the past 10 quarters and she’s aggressively shedding underperforming business units and investing billions in growth areas like cloud computing to revamp the company. But back in mid 2013, when IBM bought cloud data center hosting company SoftLayer for $US2 billion, the company said it planned to nab at least $US7 billion in cloud computing revenue by 2015, and that it was already more than halfway there.